Novice users often have problems with the configuration program. 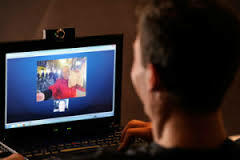 In this article we will learn how to configure Skype on your computer. For, to begin setting up the program, go to Tools-Options. Let us consider the points of the program settings. There is nothing complicated. Put down checkmark those items, you need. Basically, You can use the default settings and. Options for audio input Here are adjusted through a microphone and output through the speakers. initially, customizable microphone. Select the drop-down menu entry, the microphone is connected. If the microphone built into the webcam, it is better to choose as her microphone. If the microphone, that you plan to use a very sensitive, it is better to keep a check on Allow automatic microphone setting. In this case, at excessively strong signal, the system itself will reduce the volume of the microphone, and his voice will not be distorted. further adjusted speakers. To do this in the appropriate drop-down menu, select the appropriate device for sound output. Just below, you can adjust the volume. To check your speaker, Click on the green circle with the white triangle, which is located to the right of the drop-down menu. If everything is configured correctly, you hear the sound. When you open this configuration item, should be broadcast on the screen image from the webcam. If this does not happen, check, correctly connected and installed a webcam. If you do not like the parameters of the image (brightness, color, etc. ), they can change the webcam settings. Here you can choose, To transmit images from your camera. We recommend you select to nobody. With this configuration,, call acceptance are not yet included video transmission. Show companion image can be one click in the conversation window. This feature is useful for people, who often travel a lot or a working trip. Function Skype Wi-Fi It allows you to pay for services of private Wi-Fi networks using a personal account Skype. tab Security Settings You can configure, from whom to receive incoming calls, chats and who show video. Below, you can choose, whether or not the power status of the Internet, allow cookies or not and whether to display targeted advertising. Basically, All these settings on Skype functionality does not affect, so you can leave it as it is. tab Blocked users Users can mark, calls on which you do not want to receive. It's kind of blacklist. Block User at any time can be unlocked. here, perhaps, and a full list of options, you need to do for normal use with Skype on your computer. How view, In most cases, the settings can not be changed, tk. program initially ready to use.